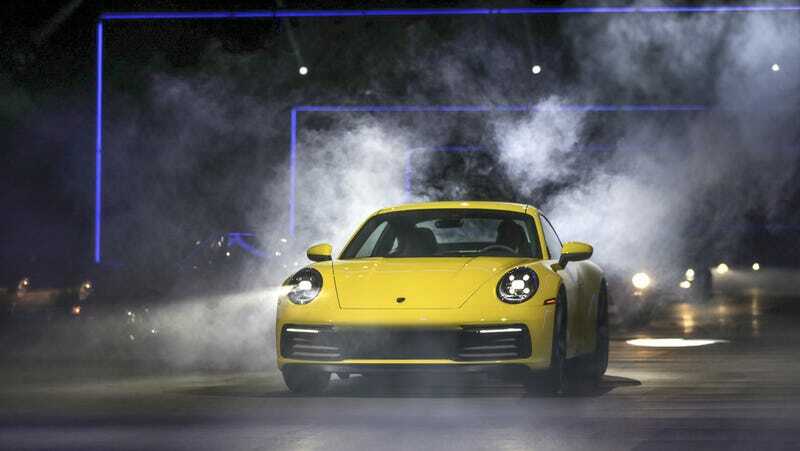 The 2020 Porsche 911 is out and so are its dimensions. Mostly. And guess what? It’s larger and heavier than the outgoing model. Because of this, I believe that the 911 should no longer receive the performance-oriented RS models. Before you start screeching, let me walk you through it. Whereas only the four-wheel drive 911s got the wide-body treatment in the previous generation, all of the 992-gen cars will come standard with those wider bodies now. The rear fenders and fronts are 1.7 and 1.8 inches wider, respectively. The 96.5-inch wheelbase of the outgoing model has been kept the same, though. And the new 911 is 121 pounds heavier. Since at least the 991 generation—my coworkers spent a good half hour tearing each other’s hair out whether it goes back to the 991, the 996, the 993 or earlier—the 911 has made shifts from a sports car to a GT car. It’s gotten larger, more stable, more comfortable, and easier to drive. The engine has become more and more refined. The new one even has a fixed cupholder behind the shift lever. A cupholder. At this point, the car is basically a 928 with the engine in the wrong place. And that’s fine. People like the 911 precisely because it’s comfortable and practical. Those back seats are good for small children and even adults, in a pinch. And they’re perfect for storage, making the 911 a wonderful daily driver. The rear-engine setup makes for predictable performance characteristics, or at least predictable dinner-party conversation about your understanding of its performance characteristics. Soon, Porsche will start rolling out the performance variants of the new 911. The Turbo, Turbo S, GT3, GT2, and so on. Those are all fine, but I’m drawing the line at the RS models. The 911s should not get RS models anymore. RS stands for Rennsport, which is German for “racing sport.” The 911 variants that bear this moniker are the sharpened and track-focused ones, like the GT3 RS and GT2 RS. These are cars designed to break records and set new Nürburgring lap times. They have no back seats or even a seat pan because it’s all roll cage back there, dramatically reducing the daily practicality of the vehicle overall. Further, these cars use the stiff, molded carbon fiber seats and ride on super stiffened-up suspension. They are not supposed to be comfortable. They are not GT cars anymore, despite being built on GT platforms. So why are we making track cars out of GT cars? Yeah let me just YANK my duffel bag out from this cage back here. Rather, if you want to make a balanced and dedicated track car, do it to a platform that existing race- and supercars already use. Do it to a mid-engine platform. Do it to the Cayman. Give the Cayman the RS options and let the 911s be the GT cars they clearly have turned into. It’s time to split the variants up. The Cayman doesn’t drag around extra, unused space. You can reduce, reduce, reduce all you want, but isn’t it easier just to start with something smaller in the first place? It’s lighter, too, which is always good for the physics of going fast, stopping well and changing direction easily. Call it the Cayman GT4 RS or something. Don’t kneecap it to be worse than the 911, let it be Good. Let it shine. Of course, this separation will never happen. Porsche will keep making 911 RS models because it can charge top dollar for them. The 911 fanatics, drooling, will devour the specs and then regurgitate them to everyone else as gospel. But then, I guess you have to ask about these so-called driving purists who will champion a “track-focused” 911 GT car that just gets bigger and heavier with each generation. It’s almost like they’re... biased... fanboys.